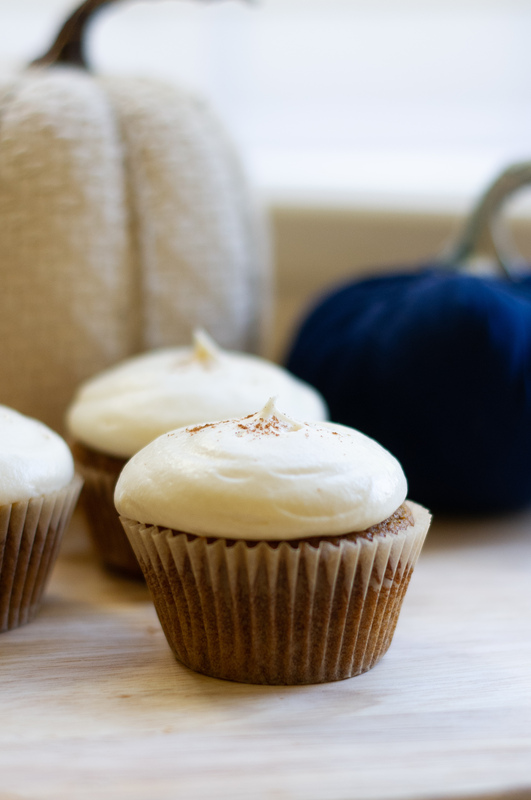 Pumpkin Cupcakes with Maple Cream Cheese Frosting | Get the recipe for the delicious cupcakes! I’m celebrating this season by sharing one of my favorite recipes with you all! 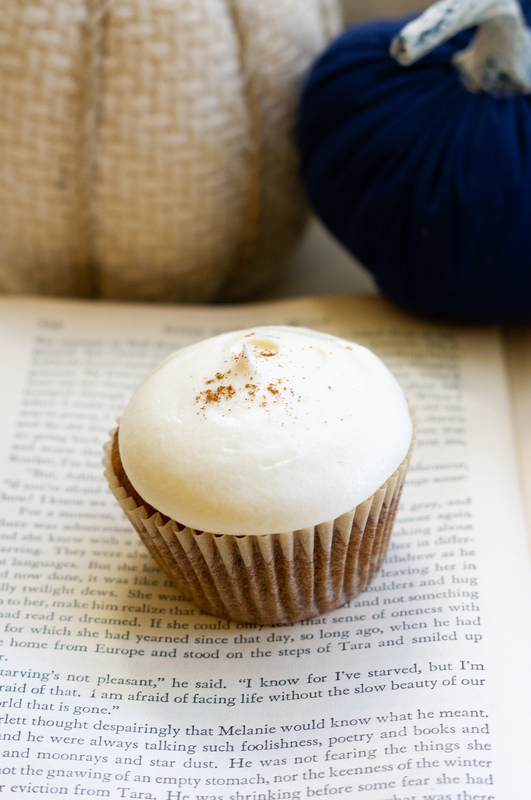 Pumpkin cupcakes with maple cream cheese frosting. They are sooo good! I love fall in Michigan! With the crisp cool air and all the trees changing colors, it makes me want to stay inside and drink warm apple cider. Totally cliche – I know. It has really started to feel like fall around here, so I decided to make some pumpkin cupcakes to bring to our weekly bible seminar. When I was testing out this recipe I felt like the first batch was missing something. So I decided to include some maple syrup into the batter and in the frosting. This definitely changed the flavor and I hope that you all taste it as well! I really wanted these cupcakes to taste like pumpkin pie with some really rich frosting on the top. Almost like adding whip cream on top of your pumpkin pie. 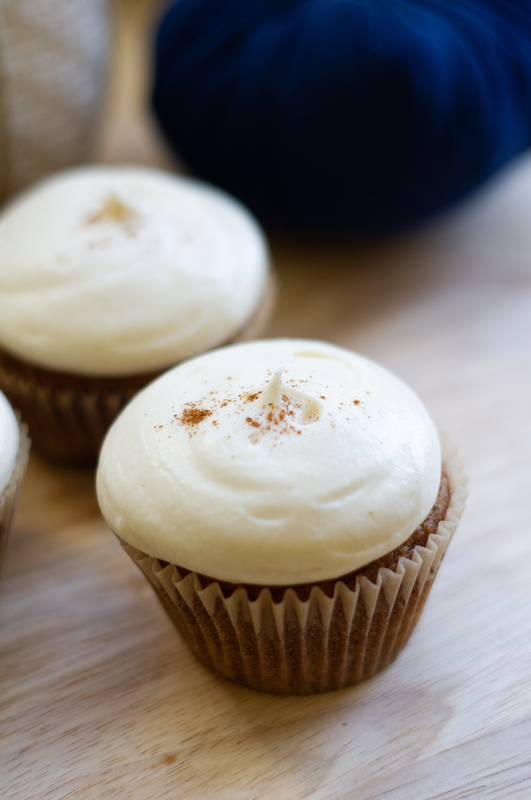 I wanted the cupcakes to have some spice from the pumpkin pie seasoning and cinnamon, plus a little sweetness from the maple syrup. I think that I’ve captured that in these cupcakes. Let me know what you think and leave a review in the comments below! 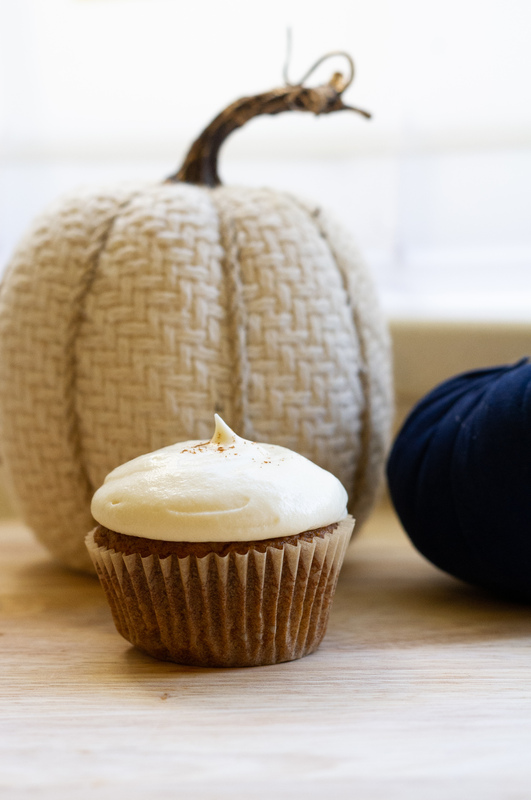 Classic pumpkin cupcakes with a sweet maple cream cheese frosting! Preheat oven to 350 and line a 12-cup muffin pan with cupcake liners. Whisk the flour, baking powder, baking soda, salt, cinnamon, pumpkin pie spice together in a large bowl and set aside. Whisk the oil, eggs, brown sugar, pumpkin puree, vanilla extract, and maple syrup together in a medium bowl until combined. Pour the wet ingredients into the dry ingredients and use a mixer or whisk to combine. The batter should be thick. Spoon or use a cookie scoop to add the batter into the pan, filling the cups only ⅔ of the way up. Bake 20-22 minutes or until a toothpick inserted comes out clean. Allow the cupcakes to cool completely before icing. In a mixing bowl fitted with the whisk attachment, beat the cream cheese and butter together on high speed until smooth and creamy. Add the confectioners’ sugar, vanilla, and salt and beat on low speed for 30 seconds, then switch to high speed and beat for 2 minutes. If you want the frosting a little thicker, add the extra 1/4 cup of confectioners sugar. Make Ahead Instructions: The cupcakes can be made a day in advance. Allow them to completely cool and then cover and store at room temperature. You can also make the frosting a day in advance and store in the refrigerator until ready to use. Allow to come up to room temperature before using.